Denver, Colorado. 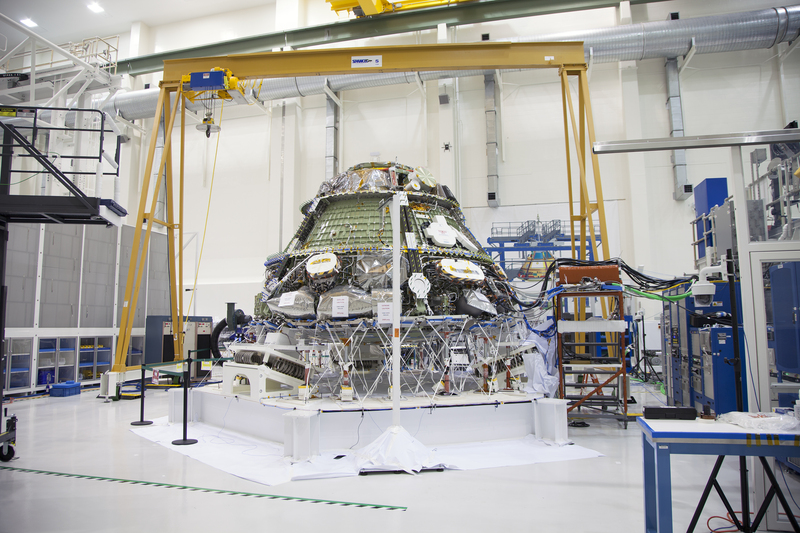 April 29, 2014 – Lockheed Martin and NASA engineers have verified that the Orion spacecraft successfully passed an important environmental test called Multi-Point Random Vibration Testing. This test shakes the spacecraft’s crew module to simulate the vibration it will experience during launch and ascent. Monitoring the spacecraft’s performance through environmental testing helps to ensure that Orion will safely carry humans on future missions to deep space. Engineers had two primary objectives during this test. The first was to correlate test results with model predictions, ensuring the spacecraft can withstand the anticipated levels of vibration during its first test flight later this year, Exploration Flight Test-1 (EFT-1). The second consisted of monitoring more than 20 avionics and propulsion components to verify their performance while subjected to the vibration environment. Orion’s next environmental test will occur when the crew module and service module are stacked together. During this test, engineers will illuminate the spacecraft with different radio frequency signals it will experience during EFT-1. Engineers will verify Orion can withstand all the radio frequency sources it will be exposed to during launch, on-orbit, ascent and landing, ensuring there are no disruptions to critical systems on the vehicle. During EFT-1, the uncrewed spacecraft will launch on a Delta IV Heavy rocket and will travel 3,600 miles beyond low Earth orbit. That same day, Orion will return to Earth at a speed of approximately 20,000 mph for a splashdown in the Pacific Ocean. EFT-1 will provide engineers with critical data about Orion’s heat shield, flight systems and capabilities in order to validate spacecraft designs before it begins carrying humans to new destinations in deep space.